This is the first of three web pages explaining the development of a small application which I wrote for turning data in files into graphs on the screen, and to give me a way to draw lines on the graph. The placement of the lines is "remembered" by the system from one session to the next. I buy and sell shares in the stock market. It is NOT just about looking at past prices, consulting a crystal ball, and placing your "bets"... but the pattern in past prices is not "useless", either. That diagram isn't quite right... but should give you the idea until I can do a better one for you. The dots are the price for the stock...rising nicely, as you see! The green lines are by me, using my judgement. They define my guess as to the limits of what might happen in the future. The fundamental feature of the application that this tutorial discusses is to make managing those green lines, for multiple stocks, user friendly. The application will only present one such graph at a time, but it will be easy to switch between data sets. Each data set will have and remember its own green lines. For years, I've dreamed of a computer program to help me with my investing, and I am finally getting close to producing one.... which is not what I am going to do in this tutorial. But I will go into some of the ingredients of my stock prices watching program, generally useful ingredients which you may have your own uses for. Getting the computer to draw my diagrams will lead to several benefits... I won't be lost in a sea of bits of paper. I will be able to find the one I want. But more importantly, I can get the computer to routinely and rigorously check the progress of any stock about which I've drawn a diagram, and bring different classes of stock to my attention... those I haven't reviewed recently, those which are performing as I thought they would, those that aren't. With the diagrams I can see what's rising (or falling) rapidly, or not so rapidly, etc. This tutorial is huge. Not at all typical of my tutorials. But it covers a lot of ground. It looks at a "grown up" application, not a little demo. The sourcecode will be available. The programming is done. The tree pages of tutorial are "done"... but they need editorial work. The information in the tutorial is good. But the quality of the presentation and the English in the text still needs work. But it is already worth at least what you're going to pay for it. Here's an outline of what is in the rest of this page... the first of three which between them tell the whole story. First you'll be shown a simple way to make a set of data available to a program. In the final version of the application, the data on prices (many Date/ Price records) will come from an external data files. Initially, while building my way to display that data and put some "prediction" lines on the graph, I'm going to hardcode the data inside the program, so it is easily available, and we won't have to think about external data files... at first. Apart from anything else, this "data from hardcode" bit will be an example of a development technique: Don't try to do everything at once... but always keep in mind where you are going. I'm "shirking" data FILES for the moment, getting my data more easily. But I will be building the demo app in such a way that in due course the "easy" data source can be swapped out for "data- from- external- file". Then we'll build a tiny app which merely gives us a "bit of paper" to draw the diagram on. We'll take a moment to look at making that flexible, making it respond nicely to the user's wishes as to how big it is. We'll take a deep breath, and push through two not-trivial bits: "Just" drawing a graph with the stock prices on it for different days, using "easy" data. Not hard, really, but it took me over a day to write it up... so not "easy", either. Once we have that much working, we will make things fancier: We will provide scaling services so that different date ranges can be shown, the size of the graph can change, and the range displayed on the Y axis can change. that will be "fun". Extending it from there to fully meet our wants is a little tedious. Especially if, as we will, we make the scaling flexible... but we will do it. Once we've got that much working, applying the two green lines to show what we think the upper and lower limits of the stock's price will be in the weeks ahead is relatively simple. Not so simple is making it possible to draw AND RE-DRAW those lines... but we'll do that too, as the grand finale, which I have put in my separate web page about drawing and moving two lines on a graph.. Along the way, we will develop a way to store efficiently our idea of where the price limit lines should be. There was once a language called BBC Basic. Some would criticize it today, and certainly it permitted the use of bad techniques. Other Basics remain to this day ("Beginners All-purpose Symbolic Instruction Code"). They may or may not have something BBC (and other early) Basic(s) had... the "Read" and "Data" statements. Do you see? The "Data" lines were like hardcoded data files. The first call of a "Read" statement found the first data line, picked up what it needed **and remembered what it had already used. ** Thus, when any further "Read" statement executed, you got the next datum, then the next, and so on and so on. When I write my price watching program, I will of course be using external data files to hold the data. But for this demonstration program, that's extra complication we don't need. The data for the demo will consist of pairs of numbers, both positive integers, The first will be quite large, and stand for the day the price was seen. The second number will stand for a price, in pennies. There will be many pairs of such numbers, in reverse chronological order. (That order is something I am specifying in the design. A datafile of prices could have other set ups, of course, but for my program, I will ensure that data files arranged as I have specified will be available. Using a large number for the date isn't as daft as it seems. qexpand why not daft, perhaps. I am starting this tutorial on May 7th, 2014. The number for that date, in "my" system is 41766. Tomorrow, May 8th, will be "day" 41767, and yesterday was 41765. ANYWAY... for this demo program, I'm going to store my data in a very big string called sData. I will separate records with forward slashes, and the fields in a given record with hyphens. I'll use a global variable (bad... but sometimes you break the rules... carefully) called wWhereInData which will point to the next unused character in sData. And I create a procedure called ReadRecord which will return the next two numbers from sData. Run it. Click "Read Data from hardcoded string" repeatedly, and a new record should appear at the top of the list (pushing the older ones down) each time. //w1, w2 can have anything in them when the SR is called. Irrelevant. //Pick up two numbers from global constant sData. =-=-=-=-= So! We have a mechanism for supplying a quantity of dates and prices to our graphing program. Put that bit of knowledge to one side for the moment. However, to do even just the basic graph of prices we talked about, we're going to have to get a whole lot more clever, to deal with the issues of "squeezing" our real world data (even the simulated "real world data" we will create for testing our code) into the coordinate system of the drawing area on our screen. The first of several secrets is this: Develop your "answer" using simple numbers which you can get your head around. But your "answer" must be done in a way which can "digest" any numbers. Another secret is to think of the coordinates-based drawing slightly differently than I suspect many people do. The "usual", I would guess, way of thinking of drawing with coordinates is to think in terms of infinitesimal points. In drawing on a computer screen, you are really talking about switching on or off pixels of very real widths and heights. On a modern screen, they may by tiny, but they are there. For my early development work, to keep the numbers down to things I can deal with in my Tiny Little Mind, and draw (ink on paper.) For this, I am using a drawing area which is only 30 pixels wide and 20 high... and before you rush on, and say, "Okay, that's easy enough"... stop and think. As I was saying, Lazarus provides a built-in way to draw a line. So... we are working with a 20 x 30 drawing area. What numbers do you think you use to draw from the upper left to the lower right corners. To. Not past. What are the EXACT numbers to JUST get both the corner pixels colored green (and all the others in between, too, of course)? Now... I said we'd start with "human sized" numbers, and then "do things" so that we can take advantage of the computer's power. And we will. And we are going to start building in those "things" now. The way we make our program flexible is by careful use of variables and constants. If you know that you will never want to change some number, until you one day re-write the program, put it in a constant. If you MAY want to give the user access to something, put it in a variable. At this stage, in this project, I see nothing that I'd want in a constant. We will put a few things in variables which we won't necessarily give users a way to change. But we will keep the possibility open. Those parameters will be "constants", in effect, for the user, until we add code. But set things up so that you COULD add code. We're going to go back to our growing application now, and simply build something which sets up the drawing area, and draws a line from upper left to lower right.... but is set up with flexibility built in. First, we'll do it "badly", NOT flexibly. All the following will do is set up a drawing area, and, when you click the Do It button, put a diagonal line across it. //  reasons we need it, trust me! Now add two input boxes to the application, one for drawing area width, one for drawing area height. Use edit boxes. Put labels beside them. Yes... if you put something other than a number in the edit box, it would cause problems in a commercial application, but you are not going to release this, are you? You can remember: These edit boxes should only have numbers put in them. Hard-code the initial text property values for the width and height edit boxes 35 and 25... yes, slightly different from the width and height we have been using. Now. It "should" be simple to Just Do It, and it would be... apart from just one line. I may be making this more complicated that it NEEDS to be. Better than not complicated enough. There's nothing wrong with what we are doing (as far as I know), but it may not be necessary to go "back" quite so far if you want to change the size of the bitmap. The Create method sets aside some memory for the object's use, apart from other things. Whenever you do a Create, there must be a matching "Destroy". At the moment, we are relying on the "Destroy" that takes place as part of the closing of the application to supply the "Destroy" we need. But if we want a different sized bitmap on Image1, we will have to proceed carefully. As is always the case when we want to do something more than once somewhere in an application, it is best to put the code to be executed multiple times in a subroutine of its own. We need to do TBitmap.create both when the application opens for the first time, and also after we have decided on a new size. And called the destroy method for the first bitmap before we create the new, different size one. //   judging the value, here, not worth the nuisance. //   we will be assigning to it. The code above creates a little app which will put a "graph" on the application's window. If you change one or both of the values for "width" and "height", and click "Resize it", you get a new, blank bitmap displayed on the new, different size TImage control. Clicking DoIt at any time draws a line diagonally across the bitmap. I trust that code is sufficiently readable? In the handler for the FormCreate event, we set some global variables to initial values, and call EstablishBitmap. EstablishBitmap creates a drawing surface on Image1. And it fills wGrGAWidth and wGrGAHeight with the Width and Height of the "Graph Area". (I will try to say more about this in due course. The "Graph Area" is that part of the bitmap to the left, and above, the two axes. And that's about all that happens until we click DoIt or ResizeIt. Clicking DoIt draws a diagonal line across whatever bitmap currently exists. Clicking ResizeIt calls the Destroy method of the current bitmap, but then calls EstablishBitmap, to put a new one in place, after first consulting the "width" and "height" edit boxes. We're now going to work for a bit on an image with nice "human size" numbers... the whole drawing area will be 30 x 20. (Horizontal number will be first throughout. Beware the vertical number, though. While it will always be second, sometimes it will tell you how far down from the top a point is... that's the usual way in computer graphics... and sometimes it will be how far up from the bottom something is, as in your earliest graph drawing. And sometimes where "zero" is won't be the edge of Image1... but we will overcome all these ways to go wrong. I'm going to have two axis lines. They will run to the top of the drawing area and to the right hand edge. They will be one pixel wide. A left margin (6 pixels wide, for now) and a bottom margin (4 pixels) will be created. Gr for "to do with the GRaph"
Left/ Bott for "left" and "BOTTom". Here's LDN008 revised to draw in the horizontal axis. Note that a separate "DrawGraph" procedure has been set up, to "contain" the drawing of the graph, and the "Do It" button has been re-purposed... it now simply calls DrawGraph. WHY is it so messy? Because we ARE dealing with drawing on a surface with point 0,0 at the upper left, and with the biggest X and Y coordinates at the lower right. Most eople are used, in "everyday life" to things being "the other way up", and even once that's taken care of, the 0,0 of our graph is not at the lower right of our bigger drawing area. You can pretend that says "on day 9, the price was $13, on day 11, the price was still $13, on day 13, the price had fallen to $12", and so on. Don't worry... we'll be doing "proper" dates and prices by the end! ... which "simply" draws the bottom, X, axis line. That really does have to be EXACTLY right. An extra "-1", or a MISSING "-1" will come back to haunt you terribly... even though a big part of my reason for writing this was to lay the ghosts of my own confusion in these matters, I still, even while "paying attention", frequently made such "errors of one". They DO matter! You have to get the endpoints of the line (highlighted in red) in just the right places. I've shown the coordinates, as used in moveto and lineto in green. Such numbers will be called the bitmap coordinates, to distinguish them. I determined the bitmap coordinates for the left hand end of the axis lines by going back almost to "counting on my fingers". I drew the diagram. For the X bitmap coordinate, I knew that the first pixel of the margin was in column 0, then next was column 1, and the one AFTER the 6th margin pixel would therefor be pixel NUMBER 6. I again "counted on my fingers" for the Y bitmap coordinate of the left hand end of the line. It had to be 15. Now, from my dimension variables, where could I get 6 and 15? The six was easy: wGrMarLeft. Not wGrLeft plus 1 or minus 1... which you often need... but simply wGrMarLeft. It is a bit of a black art... just remember: You have to get EXACTLY the right number, and a +1 or a -1 may be needed, and you should draw a diagram and count on your fingers. Figure out what it needs to be for specific cases, and develop a variables-based formula which gives you the right numbers. So.... having figured out where the X axis line goes, and assuming that a line a single pixel wide is adequate, doing the vertical axis line is easy, isn't it? It was genuinely only when I got to this point, and looked closely at the result that I discovered something. Image1 on my application's window, with its two axis lines (after I've clicked "DoIt") had a black line across the bottom and up the right hand side. I wrote several paragraphs "explaining" this, its consequences and cures. And then realized that the black lines came from a different source than I expected. And so threw them away, and dealt with the issue differently. You, with the benefit of this tutorial, may never see those black lines. We make two functions: iBitMapFrmHumX and iBitMapFrmHumY. (In the course of developing this project, this wheel was invented twice. The name iBitMapFrmHumX was discarded in favor of iGAtoBitmapX, which was used for everything previously done with iBitMapFrmHumX after a certain stage in the program's development. Plans were in place to similarly slim down the corresponding functions for Y coordinates, but with humans and bitmaps numbering the Y axis in opposite directions, perhaps both functions will remain necessary to handle subtle differences? "This is PROGRESS? ", I hear you wail? Yes! It is! Really! Well... it will be when we put "the guts" into the two functions. That IS better than what we need at the moment, isn't it?! There's just the little matter of writing "the guts". And let me warn you up front: They are similar, but NOT the same. Always start such work by figuring out how to deal with the end points. Get the formula for them right, and the everything else will just fall into place. 22 in human terms should convert to 29.. this from the right hand end of the horizontal axis. Notice, among other things that with X as one number goes up, so does the other one. But for Y, as the human number goes up, the bitmap number goes DOWN. When you've worked out those values, and if you keep the "ingredients" (margin, overall size, axis width) in mind, you will probably be able to come up with the following. More importantly, those numbers will give you the means to test your guesses... I mean "deductions"!... as to what the formulae ought to be. //  iConvert is taken away from should be 14. //  from a constant to obtain a varying but DEcreasing "output". There IS a fair bit of text in the most recent code snippet, but it is very "regular". Once you analyze the pattern, there's not really a lot of complexity there. The "details" have been swept away into inside the iBitMapFrmHumX and -Y functions. I write these tutorials for you as I develop new applications. When I first wrote this paragraph, the above was WORKING... for iImageWidth=30, iImageHeight=20, wGrMarLeft=6, etc.... but I hadn't tried to USE the code's flexibility yet. At the time, I would have said. "If all is well, the Resize button should still work just fine. (That will change the values in iImageWidth and Height)." "Should" have done... but we know how much that counts for in programming. What you said always trumps what you meant it to say. Before going on, I checked one or two other things, even though they can't be changed as easily as the overall height and width of Image1. But, because the code is written for it, it isn't too hard to try different margin sizes. Hurrah! Easy tests passed. It doesn't mean that the code can cope with "anything"... but at least it copes with some of the things I've thought of. Notice: Because of the way the program is written, I can change my margins and my image size without making ANY changes to lineto and moveto statements. The one thing I couldn't EASILY do with the existing code at the time I wrote the paragraphs above was to make thicker axis lines. I could tell the program that the axis line WILL be thicker, say 3 pixels, just by changing the values in bGrAxWidX and bGrAxWidY. Ha! I was in a relaxed frame of mind just after doing the tests, when I wrote the first version of the previous paragraphs. I thought all was well, that I could get on to the next phase. I also wrote "But I won't see thicker axis lines. It would be easy to provide for thicker axis lines, though." Well, and it was just as well, I thought I'd TRY changing the values in bGrAxWidX and bGrAxWidY. I thought I could anticipate what I would see. I didn't see what I anticipated. And for several hours I misinterpreted what I was seeing. Eventually, I wrote the code which allows axis lines of any thickness. (It was quite easy, but not without the odd little "gotcha" getting me, at first. Why to I moan? To warn you against complacency. To encourage you to make tests whenever you see one that can be made. To explain why the code, quite a way up the page, HAS the "extra bits" which allow drawing wide axis lines. We have a bitmap. On that bitmap, we have two axis lines. To the left of, and above the lines is a sub-section of the bitmap which I am going to call the "Graph Area" because that is where we will be doing our graph, and the lines predicting the movement of the stock price. Note: If wGrGAWidth is, say, 20, that means that the "name" of the right hand pixel, when you base the "name" on calling the first pixel to the right of the axis "0" is "19". But, because lineTO draws TO, but not including a destination, to draw all the way to the right hand edge of the graph area requires a lineto(iBitMapFrmHumX(20),y); command. Yes... it is a little hard to stay on top of it all. But I don't think it can be made any "simpler". In the ting we just did, we cheated slightly. We "drew" past the edge of "the paper". That will work if our line needs to go to the edge, and is nearly vertical or nearly horizontal. In other cases, we'll need a fancier answer, which we will put in a subroutine we will call MoveLineToAndInclude. It will have four parameters... the start and end points, in "human" terms, with 0,0 being the lower left-hand corner of the Graph Area. Once we have that, MoveLineToAndInclude(0,0,wGrGAWidth-1,wGrGAHeight-1) will draw a line, in whatever color the "pen" happens to be set to, from the lower left hand corner of the graph area to the upper right-hand corner of the graph area, which is also the upper right-hand corner of the bitmap. When you test it, you won't be alarmed if it draws 11, not 10, pixels, will you? If you draw one at 0,0 and one at 10,10, and one at all the pixels in between, you ARE going to draw 11, aren't you? It is this sort of "error-of-one", or "fencepost" error that can drive you potty. ... in under 15 minutes. There must be a bug in it which I won't spot until it is much harder to deal with. Sigh. About an hour ago, we were talking of putting some datapoints on the graph. We'll do it very crudely, at first. The following go in the DrawGraph subroutine..
Crude! But it WORKS! Hurrah! A graph with some "stock prices" on it. //   scaling things to fit graph well. //  above the two axes. //ver 13 May 14, 16:18... see LT3Nf.htm, if you need to alter. We've built an application which can be displayed in different sized windows. And the area devoted to the graph can be changed. But, so far, the scales (X and Y) are fixed. This means that a larger graph just shows more blank space, and it means that the data range the application can display is restricted. We're going to make some changes to the program, to dispense with those limitations. We will ensure that the program is always presented with data, from whatever source, in reverse chronological order. If we can assume that, aspects of the programming are simplified, and execution times are improved. Think about it: If the user has said that he/ she only wants the graph to look back from today for 6 weeks, if you know the data is in chronological order, you scan the data until you encounter a date from more than 6 weeks ago. When you encounter that, you can dispense with the rest of the data file. We will, for the moment anyway, continue using the same data, i.e. Dates are expressed as days since an arbitrary start date. For our development work, we will initially say that "today" is day 20, and we only want to go back to day 9. So... to use all of the Graph Area, we should be scaling things so that on the X axis, we plot "9" at the left hand end, and "20" at the right hand end. Now... the number of pixels available to us for this changes from time to time. Every time, in fact, that we resize the bitmap that the Graph Area is part of. However: although we don't know "the number" for the current width of the Graph Area, we do know that whatever it is, it will have been stored in wGrGAWidth, and is thus available to us. We'll put the date we want to be shown at the left hand end of the graph in DateBackTo, and the most recent date we want shown in DateFrom. Both are inclusive. In other words, in the specific case of our test data we want day 9's column at the left and day 20's at the right... and both ON the graph. (In due course, we may wish to arrange for some blank space to the right of the last data point, but that's something we can introduce later. I'm not just saying that wishfully. I've worked out that we can. So... not unlike the challenge that faced us before when we were converting from bitmap pixel coordinates to human and graph friendly coordinates, we have what is a scaling problem. For the X axis, in our specific case, we want some numbers which go from 9 to 20 (inclusive) to be evenly spread across the range 0 to whatever's in wGrGAWidth-1, inclusive. (And yes, the "-1" is important, and right. Wouldn't it be nice if wGrGAWidth-1 were always 11? Then the rule would be simple: Date m should be shown on the graph at m-9. What if wGrGAWidth-1 were always 22? Then the rule would be (m-9) times 2, wouldn't it? All such scaling problems come down to the same formula: The number you need is your previous number minus some constant (k1), and then that is multipled by some other constant (k2). If your high and low numbers (for the data, 9 and 20, in our case) are in the variables DateFrom and DateBackTo, as we said they would be, then k1 is simply DateBackTo. Ah... is nothing ever simple? In our day to day life, those are "just numbers". Few of us have got beyond elementary school, and thus still dislike "fractions", but even so, they're still "just numbers", even if yucky numbers. When you put numbers into computers, a whole bunch of question arise about how you are going to turn even the short list I gave above into 1s and 0s. Some schemes work well for a whole bunch of types of numbers... but they tend to be complex, use up memory and storage, and have associated speed penalties. Simple, efficient, fast schemes tend to suit only a limited range of numbers. Everything we've done so far has been "computer friendly". I've used byte, word and integer data types quite deliberately, always using the "best" type (in the narrow, programmer's sense of that word) for any given need. Now, however, as part of our scaling wants, a division is involved. Sigh. That leads to "difficult" (for the computer, too) numbers. So what we're going to do is this: We're going to take our nice byte-, word-, and integer- type numbers, turn them into "real"(-type) numbers... using that term "real" in the broad "mathematician's" sense, not the narrow Pascal (Lazarus, Delphi) sense. (I will be using the Pascal "single" data type. So... to repeat the heart of that!... we will turn our numbers into single-type numbers long enough to do the work that we need fractions for, and then we will "throw away" the single-type number we've arrived at when it has done its job. ... which comes to 6.666..
And so we will put that data point 7 units above the x-axis line. Not so very "difficult" in underlying principle, just hard to express succinctly, if you're trying to convey the why behind the what. We will, of course, use functions... one to convert from our raw data to an X coordinate, one for converting to a Y coordinate. I wrestled with something here. The "Pixels" method is built into Lazarus, and assumes that if you give it, say, 5 and 12, you want to color in the pixel 5 across, and 12 down on the bitmap. iBitMapFrmHumX, and iBitMapFrmHumY are our functions, which take our raw data and convert it to suitable numbers for the Pixels method. All this we have discussed. Those functions could be simple because I'd "cooked the books" and provided only data which would, without scaling, fit nicely on a sensibly sized (if rather small) bitmap. Half of me wants to be "clever", and do an all singing, all dancing function, and do both the scaling and the conversion from x, y numbers we might recognize the x, y coordinates needed by Pixels. (Different range that the numbers in their raw state, and Y coordinate "flipped" so that small raw numbers turn into big converted numbers, and vice versa, because the Y numbers on a bitmap go UP as you go DOWN the bitmap- the opposite to the way we usually draw graphs. The programming artist in me has a "gut feeling" that there might be advantages to "all in one" functions. Specifically, we might get a better mapping between raw numbers and final bitmap.Pixel coordinates. And then the programming scientist in me says "No! Divide and conquer!" It really "should", I think, work that way... if you can provide the right scaling constants in iScXOffset and siScXStretch... which I'm not at all sure about. In developing this program, I got to a stage where I knew there were at least two ways forward. One "felt right". The other adhered to rules I know to be good. One was complex, fraught with ways to go wrong, and potential hard-to-debug complex messes... but it was a path which might have been "necessary". I knew there was a way through by that plan... but could I find it? The other path kept the rules, but there was one little "niggle"... how hard would it be to come up with, and maintain, the scaling constants. I was puzzling over "Which way should I proceed?" I realized that I hadn't taken my own advice, not in detail, not with the sorts of numbers I wanted to use "for real". So far we have been working with "make believe" numbers which were chosen to avoid some of the complexities that the real-world numbers introduce. The advice I wasn't taking was to consider the extremes. See how everything works with the biggest and smallest numbers you want to use, see how you might handle them, and the other numbers will fall into place. The "raw", "real-world" X and Y which will give rise to a data point at the lower left of the graph will be something like 47800,5832. The first (X) number will always be "big", and an integer. The second (Y) number might be near zero, but will never be negative. The "raw", "real-world" X and Y which will give rise to a data point at the upper right of the graph will be something like 49000,5832. The first (X) number will always be greater than the X number for the lower left corner, and an integer. The second (Y) number will always be greater than the Y number for the lower left corner, and an integer, perhaps as high as 5,000,000. (As I was typing this paragraph for the first time, I worked that out for the first time... way to late to be doing so. It might be a minor nuisance, requiring some re-working of data types I laid down earlier. Sigh. Oh well... will help me learn the lesson of "know where you are going before you start the journey. I should have looked more closely at my potential data range earlier. Yes, Virginia, you really do have to look at these things that closely. Working out the numbers with a pen on a sheet of paper is easier than doing them with a keyboard, it must be said. In trying to come up with those figures, I "just naturally" went from the raw to the Graph Area to the bitmap. That doesn't mean that I've automatically come up with the best sequence... but I will investigate that first, as it seems "logical" to me. How hard is it to get from the raw numbers to the Graph Area coordinates (GACs)? Or, alternatively, how hard is it to get from the GACs to the bitmap coordinates (BMCs)? It will entail a division, and thus the number-type nuisance. Not insuperable. To make the conversions, we'll need to know the range of the "input" numbers. We can manage that. We need to know the range, the limits, of the "output" numbers that we want... Umm.. Yes! We can access those, to! Take raw numbers, convert to Graph Area coordinates. We will make iScaleX and iScaleY do this, by setting up the constants they use accordingly. Take Graph Area coordinates, convert to bitmap coordinates. ... as long as we write functions "RawToGA" and "GAtoBitmap".. which I know I can do. .. and it will be a CLOSE relative to that, and something similar for the Y coordinate, which will be at the heart of the datapoint plotting routine in our final program. It seems I have reinvented some wheels in the course of the recent discussions. Earlier, I generated iBitMapFrmHum, which has "reappeared" out of the above theoretical discussion under the name "GAtoBitmapX. And earlier, I generated the "iScaleX" function, which did what the theoretical GAtoBitmapX function should do. As an exercise in seeing that all is REALLY well, that the earlier "testbed" functions really do do all that is needed for plotting the datapoints, I am going to being in the new functions, and gradually weed out all traces of the original ones. Amazing what "little details" you sometimes "trip over" during such development work. Sigh. For a little while, I am not going to take you line by line through the development process. Sorry! Now "all" that's left, for this part of the programming, is to put into effect what the above careful work has planned. And "weeding" the "scraps" of the prototype functions iBitmapFrmHum and iScale. Because of the care during planning, we "should" not have trouble with it working. There will be a little work to incorporate all we planned, and do everything at the right time and place, but no task should be bigger than my brain can hold at one time. Particular care will be needed over the determination of the constants we will be using, both in the GAtoBitmapX and RawToGAX functions, and their "Y" cousins. We must get the RIGHT constants, and we must re-calculate them at the right times. The RawToGAX constants need recalculation whenever we change the set of raw data to be displayed. The GAtoBitmapX constants need recalculation whenever we change the dimensions of the Graph Area, either because we've changed the size of the bitmap, or because we've chosen different margin sizes or axis line widths. Tedious detail. No Rocket Science. As I said, we've already done the GAtoBitmapX (and -Y) functions once. (As iBitMapFrmHumX and -Y.) We'll need to look closely at what worked for the sample data, make sure it is still all we need, but I don't anticipate any big hassles. I have no regrets about going into such detail above. It shows you what is a Very Good Idea, and it has made sure that I really know where I am going. ... for plotting individual points on the graph. ...unless he/ she chooses to delve more deeply. The other benefit of this rearrangement is that as I make the PlotDataPoint process more complex (to introduce the re-scaling we've discussed), all of the work of that is in one place. I won't be editing multiple lines which should all have similar code on them. AND the process of supplying a "stream" of data pairs to the plotting process becomes more clear. At present, we are using a hardcoded series of Plot this, Plot this, Plot this... statements. Not brilliant, but nice and simple. We will be switching over to fetching our test data from a string, as discussed long, long ago at the start of this. If the "generate stream of data to plot" part of the program isn't quite so deeply tangled into the "how we plot one point, Things Will Go Better! Eventually, we will need a flexible program, which can assess a data set, and alter the values in the scaling constants accordingly. For now, we are going to manage that part of the process by hand, but in a manner consistent with what we will want (and be able) to do later. We have to change some of the data scaling constants whenever we change data sets. These are the constants which take, say, 47800 to 49000 and scale them down to 0 to whatever is the right hand column of the Graph Area at the time. The first will be largely a "placeholder" for the moment. In due course, it will tell us which company's prices are being watched. It is set in ChangeDataStep1, and at the same time a label is updated, so that the user knows what data is being looked at. The data types for the Max/ Min variables were dictated by the nature of the data we want the program to be able to handle. Earlier, we put in place the code to revise various variables whenever we change the size of the Graph area. We can (indeed must) use some of the numbers from that work in our present work. What are the scaling factors? When do we re-calculate the scaling factors? Add a button. Call it buChangeData, label it Change Data. Add two labels, call them laTxtDataSet and laDataSet. Caption them "Viewing:", and "laDataSet". The caption of laTxtDataSet won't change: That label is just to, umm... label... the OTHER label, the contents of which WILL change, to tell us what data set, i.e. what company's prices, we are looking at. But don't worry... we aren't actually going to implement ALL of changing data sets, yet. Just put in place the program structures where that stuff WILL go. As with anything, there's a complex web of initializations to get right. As part of the Change Data (set) process, we will recalculate the scaling factors. But we can't do that until the variables which depend on the Graph Area's size are established. But if they (GA variables) change, we must recalculate the scaling factors. All very tedious. We just have to take it step by step. At the moment, we have the subroutine EstablishBitmap, in which the GA variables are filled. It is called during the FormCreate handler, and if we click on the ResizeIt button. We are, "of course", going to put the ChangeData code into a self contained procedure... ChangeData. Actually, it emerged (not the ideal way to "program") that what I envisioned for "ChangeData" was in two parts, one of which was appropriate in some places, the both of them being needed in others. Some messy, and potentially bug-introducing, work ensued in which ChangeData was broken into ChangeDataStep1 and ChangeDataStep2. The original plan was: "We will call ChangeData during the FormCreate handler, just after we have executed EstablishBitmap." That too required re-thinking. Not all of that may have made it into this essay, but, I hope, all of the required finer points are now in the sourcecode, which will be listed in full, for this stage of the application's development, a little further down the page. We will call ChangeData if someone clicks the Change Data button. Do you see the OTHER place we need parts of it? Yes! In the code executed upon a "Resize". "Parts of it"... that's ominous. And messy. Instead of trying to do exactly what I said above, I'm simply going to slightly revise it. We will have TWO procedures which, between them, do all of the ChangeData tasks. I'm giving them the rather unimaginative names of ChangeDataStep1 and ChangeDataStep2. Part one will, eventually, allow us to switch to a different set of data, and it will assess that data to establish the biggest and smallest X and Y values present in it. Eventually, it will have a parameter which will either direct it to access the data of a particular stock, or to allow the user to interactively specify which stock should be looked at next. ChangeDataStep2 will take the maxima and minima determined in Pt1, combine them with other values, and generate the scaling factors we need for the functions which, in two stages, turn raw data points into bitmap coordinates, as extensively discussed previously. We must call both parts.. directly or indirectly... during the FormCreate handler. We must call both parts if we want to change the data set. It is because we only need to call the second part when we do a Resize that the whole business of splitting ChangeData into two parts was done. (if we are only resizing, the information collected during Pt1 hasn't changed, has it? Well... here I sit typing after about a week of working on this. And I'm about to ignore my own advice, even though I KNOW it will come back to haunt me. Well... not quite correctly, anyway. What we have so far is a pretty good set of routines to draw a re-sizable graph. And I really, really should get to the bottom of these issues, fix them. I genuinely always intended to have a band of white above and below the plotted data points, and to the right of them. For now (famous last words), I am going to rely on the provisions for them to take care of the shortcomings in my scaling formulae (another dangerous assumption... how do you know where the problem is, unless you know what the problem is?)... going to rely on those provisions to be enough, so that I can go on to the more interesting (to me) question of the two "boundary" lines. 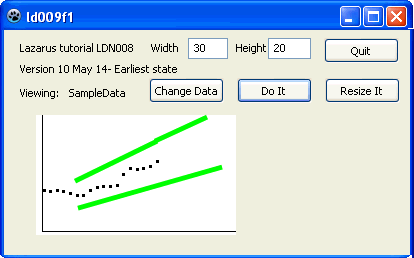 I DO have confidence that the program is sufficiently well built that the problem which is leading to the unexpected scaling will be isolated, probably in the formulae in ChangeDataStep2 which calculate siScXStretch and siScYStretch, and that one day I will be able to see what is wrong with them, and get that part working better. And if the issues are isolated, as I hope, then a fix there won't have cascading effects and mess up other things. If I find myself having to incorporate further fudges to accommodate earlier fudges, I hope I will show the craftsmanship to say "enough! ", and go back and fix what I am leaving behind now. P.S. : Later, I found part of the problem. As ever, cheats never prosper. Instead of having the computer scan the data it was going to plot, and RELIABLY find the maximum and minimum Xs and Ys, I was doing that by hand... and I hadn't put in the right numbers. Putting in the right numbers, plus a new "+1" kludge helped... but didn't entirely fix the problems. Open areas around data point "cloud"
To create what I want is quite simple. As ever, I want to put critical numbers into variables, and as ever I want to work in multiples, not absolute increments. In other words I don't want to say "make the blank area to the right of the plotted points say 100 wide", I want to say something like "make the blank area to the right of the plotted points 40% of the width of the GraphArea. They are all "byte" type variables. The numbers in them are percentages. ... I would want the graph to draw with a blank region the right of the datapoints consisting of 40% of the width of the GraphArea. We will "lie to" the formulae which are determining our scales. We will "pretend" that we have some X and Y values bigger and smaller than the actual maxima and minima, and achieve our blank areas that way. Suppose our X values actually go from 0 to 59... We'll "tell" the scaling formula that they go from 0 to 99. And suppose that our Y values go from 100 to 790. We'll "tell" the scaling formula that they go from 0-1000. Of course, in the "real world" the numbers will be messier. But the amount of "extra" X and Y to add in the various places shouldn't be hard to incorporate. siScYStretch:=wGrGAHeight/(liYMaxRaw+1-liYMinRaw);//The "+1" is a KLUDGE. siScYStretch:=wGrGAHeight/(liFakeYMax+1-liFakeYMin);//The "+1" is a KLUDGE. That takes care of most of the "create-gaps" work... all of it in the case of the X axis, but not quite all of it in the case of the Y axis. Take a moment to think deeply about the whole scaling process. And as you think about it, don't assume that what I've said and done above is 100% right. it has a problem at the upper end of the mapping process. A "too small to matter" problem, with the sort of numbers I want to work with, and with the blank areas around the plotted data points... but that "small" problem will come back to haunt me one day. Sigh. Let's say we have data with X=100, 110, 120, 130, 140, 150, 160, 170, 180, and 190. (We'll think about the Y part another time.) Ten points to be plotted. Numbers from 100 to 190. Let's further say that want to plot these on an X axis consisting of 10 pixels, the first being number "0", the last being... if there are 10... number (or "index") "9". The way to tackle such things is first to "slide" all the numbers you want to plot down (or, in some cases, up) so that the first one will go on the first pixel. So: Using CAPITAL A to stand for the number we start with, and a lower case "a" to stand for the number we need to turn it into, to get the points plotted on our 11 pixel-wide GraphArea, we start by taking 100 off of each number. The data with value 100 (A=100) will be plotted in the column of pixel 0 (a=0)... just because of the "sliding" step, as long as the next step doesn't change then number we get from "sliding", which it won't, as you will see. But! We not only need to "slide" the data, we also need to squeeze (or, sometimes, stretch) it. In this case, we can "just see" that a factor of ten is what we need. Where A=190, we start by taking off 100... that brings the number down to 90. We then divide that by 10... making a=9... which tells us that the data for A=190 should be plotted in pixel NUMBER nine's column, i.e. the tenth column. a=9. So far, so good. All works nicely with nice tidy numbers. And of course, we have to work out what the rules are for how much to slide, and how much to squeeze or stretch. But even before we do that, there's another problem. Take the same case we have been working on. What column of pixels do you use for a data point where the X value is 152. Probably column 5, UI would guess. Or 158? That may turn out to be column 6 if we are rounding, or column 5 if we are truncating. (Trun(5.8) is 5). And it will sort of work either way, as long as we are consistent, in the middle part of the graph. But what happens at the ends, especially the top end? Probably, if we use truncation, which is my gut instinct, ONLY data (in our example) with an X value of 190 will plot in that last column. Whereas for every other column, there is a range of 10 numbers which all result in a data point in that pixel column. Hmmm. I hate inconsistencies. They often come back to haunt you. But I'm leaving that there for now, for the same reasons I've fudged a few other things in this department. Fine. (Almost) when the problem is as simple as "How do we map 100-190 (inclusive) onto 0-9". However... the same rules apply, even for more complex numbers. It is just harder to be sure that you have the offset and scale numbers right. That's enough Deep Thinking for the moment. Let's get back to making it work. We already (mostly) had things working to fill the GraphArea with our data. We'd started working on creating empty areas on three sides of the cloud of data points. We got part way to "the answer" by "lying" to the program, and telling it that the range of numbers in X and in Y was greater than it was. This did the job for the gap to the right, and it expanded the scale in the Y dimension.... but the datapoints were all at the bottom of the GraphArea. Both of the horizontal bands of empty space were above the data points. All we need to do is to "push" them up the page a bit. We don't want to change how much they've been stretched or squeezed. It is almost as if we want to change the program's idea of where Y=0. That isn't exactly what we're doing, but it is close. We are changing where, in pixel units, we want the lowest plotted points. And the place to "push up" the Y's is in iGAtoBitmapY. Previously, our pixel=0 row and out "put smallest Ys here" row was the same. Now we want the smallest Ys further up the page... which means a SMALLER pixel row number, remember. Sigh. Lesson in program development: While building this, I first just made iGrBelowDataCloudGap 10, and ran some tests to see if even that would work as expected... and it did. Which meant it was safe(-er) to go forward with "being clever". Now that we've got the basics (mostly) working, we can get "fancy". We'll start with the X gap, because our requirement is simpler (just a blank area to the right of the data cloud) AND the X aspect is easier because we don't have to deal with the wretched inversion issues. Our old, fixed-sized gap answer came out of "mis-reporting" the maximum X value in the data. Doubling it, with the test data we were using "squashed" the plotted data down into roughly the lower half of the area available. (If our X data had run from, say, 780-999, I bet the width of the blank area to the right of the data cloud would have been much more than half of the total X axis. But that's a story for another time. We've chosen to express the width of blank area we want as a percent. If we say bGrGapRight:=40, we expect the datacloud to take the first 60% of the width of the screen. We have already analyzed WHAT numbers we need, WHEN to obtain them, and WHERE to apply them.... to achieve our blank area at the right of the data cloud. WHAT we need is a value in iGrBelowDataCloudGap. And this is how we calculate it. We will start with what range of X values were going to be mapped onto the pixels we have available? (That comes from wXMaxRaw-wXMinRaw. Let's say that in the present case it is 1260.) And we need the number from bGrGapRight, let's say 40(%) for working the example. That code goes very near the beginning of ChangeDataStep2, but after bGrGapRight, bGrGapAbove and bGrGapBelow have been given values. Now for the gaps above and below. Sigh. We already have them working, sort of, remember. But for the Y gaps, we need three numbers. We need liFakeYMin and liFakeYMax for the purposes of ChangeDataStep2. (We need them to calculate siScYStretch) And we need to calculate iGrBelowDataCloudGap, which is used in iGAtoBitmapY to "push" the data cloud up. Our method will be similar. We know what gap, as a percent, we want above. Call it, for this, TopGapPercent. We know what gap, as a percent, we want below. Call it, for this, BelowGapPercent. So the percent of the Y axis occupied by the datacloud, as a percent, will be 100-TopGapPercent-BelowGapPercent. We know the range of raw Ys which will be going into creating the data cloud (liYMaxRaw-liYMinRaw). And with all of that, we can know how much to expand the range of "supposed" Y values, so that the numbers for making the data cloud AND the top and bottom gaps fill the required range of pixel rows. And finally, we know how many units (in the units of the raw data) of the Y axis is devoted to the bottom gap. Originally I said: "It can't be hard (we'll find out!) to convert that to pixels-dedicated, to put in iGrBelowDataCloudGap." Well, actually it was, going by that route. But there was a MUCH simpler route, which you can see in the code below. Hmmm. Good theory. I hadn't done it yet, at the time I'd just written out the above for you, to help you see how programs are developed. User will, of course, be able to change the values in the blank-area-sizing variables. Implementing that should be (famous last words) easy, because as I was doing the early work, shown above, I was looking ahead, planning the user access. Long, long ago, I presented, in isolation, a way to provide a program with data. Then, until now, I didn't use that, choosing instead to get LD008 "working" with a very simple, very small, data set. Now the time has come to change where the application gets it's data, how it uses it. We won't go to the final stage yet, but we will be very close to it when we finish the next material. Before I make those major changes, I am going to save LD008 as "finished", and move on to LDN009 for the "bigger and better" version. We will be making some changes in DrawGraph. ... one triplet for each data point. Very crude. Very easy to implement, understand. Before the code which will be crafted from that can work, we need to ensure that elsewhere (and the right elsewhere) we always open the data stream, and set the "where to find next record" pointer pointing at the first record. We need to have the program aware of what "too old" would be. And after the data has been read, we will close the data stream, expecting to re-open it again, later, if we want to look at the data again. The data in the file must be in reverse chronological order for the plan to work. I will probably arrange for the oldest possible date to be stored in a rogue record at the end of the file. This should stop the program from ever trying to read the record "after" the last record... but the programming should be robust enough to handle that case, should it arise. "Simple" enough plan. Ha. Now I am going to go away and implement it, without doing all the detail you have been getting in the other parts of this tutorial. When the final version is done, I won't need to keep wWhereInData manually. The system will keep track of that for me... but it will be kept track of somewhere. 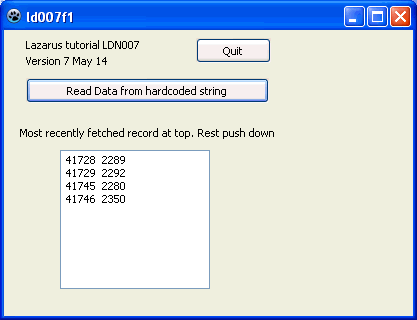 Dates are stored in the program as word type values. The oldest date we want to have in the display is held in wOldestToDisplay. That, notice, is inclusive. The sourcecode, after setting things up to fetch data from the constant sDataSource, looks as follows. If you decide to run it, be advised that you have to look closely for the datapoints on the graph, they are just single pixels... but I think you will find that they are there, after you've clicked "Do It"
//   it draws its data from a constant, sDataSource. //ChangeDataStep2; This happens inside EstablishBitmap. //This procedure does access external "constants" as well. //  tutorial explaining the development of this application. //Could be made clearer? Use wGrGAHeight/wGrGAWidth, or just work lineto in Bitmap units? //  affects all of those pixels AND pixel 3,3. //Establish which data stream is to be read, and "connect" it. //  "Ask user which data". //Update on-screen display naming the data set we are using. //  at, and will be part of designating which data file to read. laDataSet.caption:=sDataSet;//Tell the user what data we are reading. //  which users will, one day, be able to change as they wish. //    next to first record. //long as I am using the simple "data source" of the string sDataSource. //Put "prep to scan data" in a SR.
//Close and re-open datastream between "Scan to find max/min" and "scan to plot"
//  min X and Y. //  maximum X or Y coordinate, as expressed in pixels. //  would be 0.1 to bring the 0 to 100 down to 0 to 10. //  10 in the example developed above. //logic of how the blank areas on the graph are created. //  right of the cloud of plotted data points. //  the width of the GraphArea should be blank. //Deal with creating blank areas above and below data cloud. //  was also needed in iGAtoBitmapY. The "-iGrBelowDataCloudGap"
//  term is about creating the bottom gap. //  zero to wGrGAHeight (-1) (or not.. there may be a "off-by-one"
//  scale... fiddle carefully, if you must do it at all! //  Y coords terms, "upside down". //  datapoints we want to put on bitmap. //    past the top of the Bitmap. //  that max values plot properly, i.e. in top row, too. //  coordinates of the bitmap go up as you go down the screen. //w1, li1 can have anything in them when the SR is called. Irrelevant. //Pick up two numbers from global constant sDataSource.